The pronunciation of the KIT vowel clearly distinguishes New Zealanders from Australians. This vowel is famously expressed in the different way New Zealanders and Australians pronounce 'fish and chips' – a fast-food dish common in both countries. It is commonly claimed that New Zealanders say 'fush and chups' and Australians say 'feesh and cheeps'. 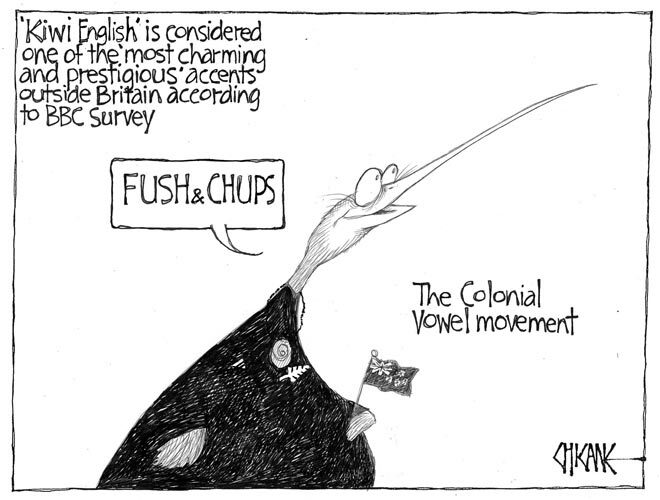 This 2009 cartoon refers to a survey conducted by the BBC in the United Kingdom, in which the New Zealand accent was rated as the most attractive and prestigious form of English outside the UK.